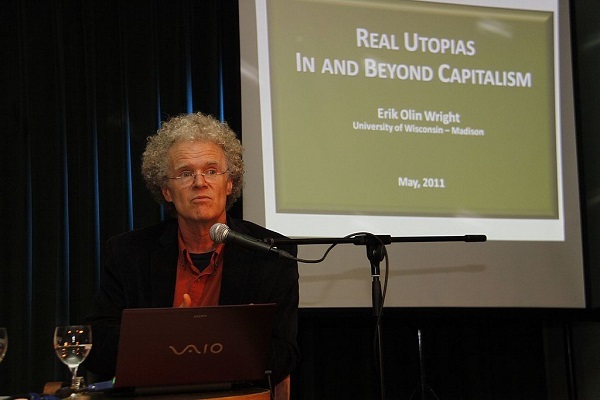 The Center for Engaged Scholarship lost another friend with the death of Erik Olin Wright. Erik waged a long fight against Acute Myeloid Leukemia that included experimental treatments and a stem cell transplant. But the disease overcame both Erik’s formidable will to live and the best efforts of a dedicated medical team. Erik was an exemplary practitioner of engaged social science. (Click here to read Michael Burawoy’s tribute to Erik in Jacobin.) In the first part of his career, he wrote a series of important books analyzing the class structure of developed market societies. Starting in the early 1990’s, his focus shifted to the Real Utopias Project. Wright insisted on the need to revive utopian thinking by focusing on powerful reform ideas that could generate momentum towards a more democratic and more egalitarian society. He organized a series of workshops at the University of Wisconsin to focus on such topics as basic income, deepening democracy, gender equality, and associational democracy. Seven of these culminated in books published by Verso in the Real Utopia series, and several more volumes are on the way. Throughout this project, Erik has shown that it is possible to produce excellent social science work by combining normative commitments to equality or democracy with the standard repertoire of social science analytic tools. Each of these specific real utopias works as a sociological x-ray that helps us to see how power works in contemporary societies and to understand better the obstacles to radical social change. Moreover, the project has inspired other scholars to focus attention on the analysis of promising reform experiments such as the participatory budgeting schemes that began in Brazil and were quickly copied in multiple locations around the world. Such research works to make clear that “another world is possible” and it builds links between scholars and activists that can accelerate the diffusion of effective reform strategies. Erik also wrote his own conclusion to the Real Utopias Project. In a book that he completed during his illness, How to be an Anti-capitalist in the Twenty-first Century (to be published later this year by Verso) Wright outlines a strategy for radical change that flows out of the work on real utopias. Wright argues against the traditional Leninist strategy of seeking to destroy capitalism in a single revolutionary upheaval. He argues, instead, for combining a series of distinct reform strategies. The first is the idea of dismantling capitalism by state-directed reform initiatives that would weaken the power of capital. The second is the standard Social Democratic project of taming capitalism by limiting its worst excesses through regulation and public provision. The third is resisting capitalism through trade unions and other forms of popular contestation. The fourth is escaping capitalism by building institutions that insulate people from the vagaries of the marketplace. Wright argues that a movement could combine all four strategies to seek a progressive erosion of capitalism that would eventually result in a different kind of society. Erik will be deeply missed, but he will live on in the students he mentored and many thousands who have been influenced by his lectures and his writings. Moreover, he taught us what social science can do in a dystopian time; it must show us the way to reshape our institutions to create freedom for all.